I spent a week in Washington D.C. this summer and the highlight of the trip was two visits to the National Museum of African American History and Culture, aka the Blacksonian (according to VSB). I wasn’t sure I could get in, because tickets are sold out months in advance. A guard suggested I get in line at noon and wait till one o’clock when all the unclaimed will call tickets are released for the day. It means you have only half a day to see the museum with that ticket (unless you wait in line another day, like I did), and you are not guaranteed tickets, but it is well worth the chance to get look at this amazing museum. Every American needs to see it. More than half of the Blacksonian is below ground, so it is much larger than it looks from the mall. The lower floors focus on the history of slavery/emancipation/Jim Crow/segregation and the Civil Rights era. The upper floors are displays of African American contributions to the arts and athletic achievements. It was thought that the average visit would be about 3 hours, but it is more than 6 because there is so much history, and so many meaningful displays to see. And this is history we don’t read about in school. It is difficult to just walk briskly by a pair child-sized shackles. A looming guard tower from Angola prison. A chapel for the casket of Emmett Till. At least half the exhibits and displayed items just stop you dead in your tracks. I am going to post just a few pics of textile-related items. The first is this gorgeous piece, a silk and linen shawl given to Harriet Tubman by Queen Victoria. Think about that. A woman born a slave in the USA could not only capture the attention of the Queen of England, but receive such an exquisite gift from her. 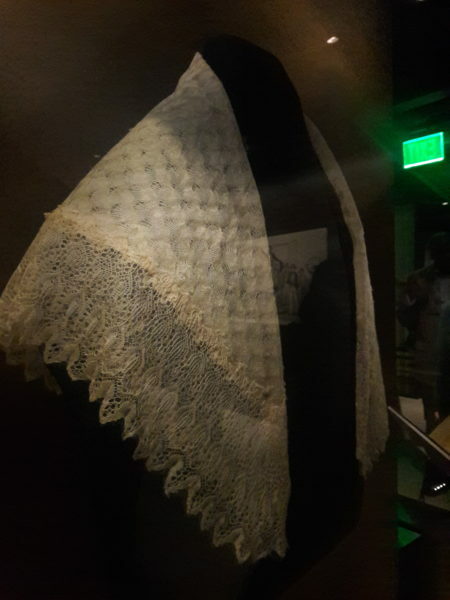 Shawl given to Harriet Tubman by Queen Victoria. And this piece, a beautiful whitework dresser scarf. I believe it is one of the few pieces documented to have been created by a slave. Quilt historians had thought most of the fine quilting was done by plantation mistresses (neither would have signed their work). We are discovering now that is not always the case. 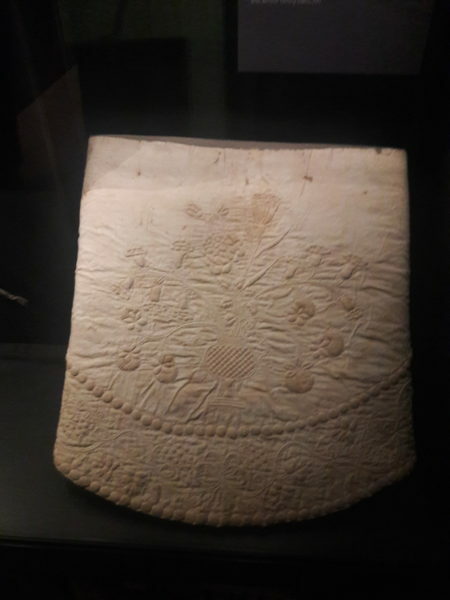 Wholecloth quilted work by an unknown slave woman. But this last piece took my breath away. It is called Ashley’s Sack. It was given by Rose, a slave on the Middleton Place Plantation in Charleston, to her nine year old daughter Ashley on the occasion of Ashley being sold away. Rose filled the sack with a few handfuls of pecans, a lock of her hair, and ‘her love always.’ The two never saw each other again. 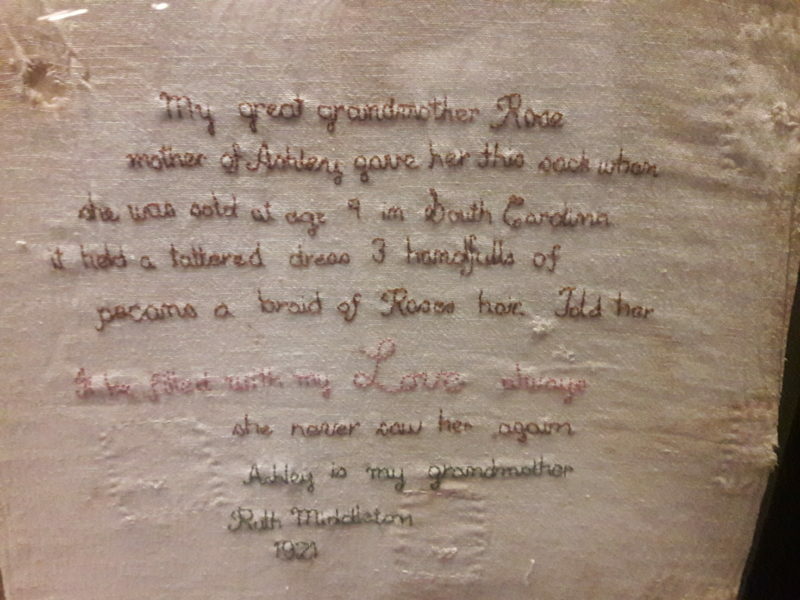 In 1921, Rose’s great granddaughter Ruth Middleton embroidered their story onto the sack. This family kept this sack for generations. Like the museum itself, it is a treasure. Thank you for the tip of waiting on line. Your post is very moving. It is definitely a museum I want to get to ASAP. GOTTA PUT THAT ON MY BUCKET LIST.